Last weekend i attended yet another hair event! This time in my hometown of Manchester, UK. 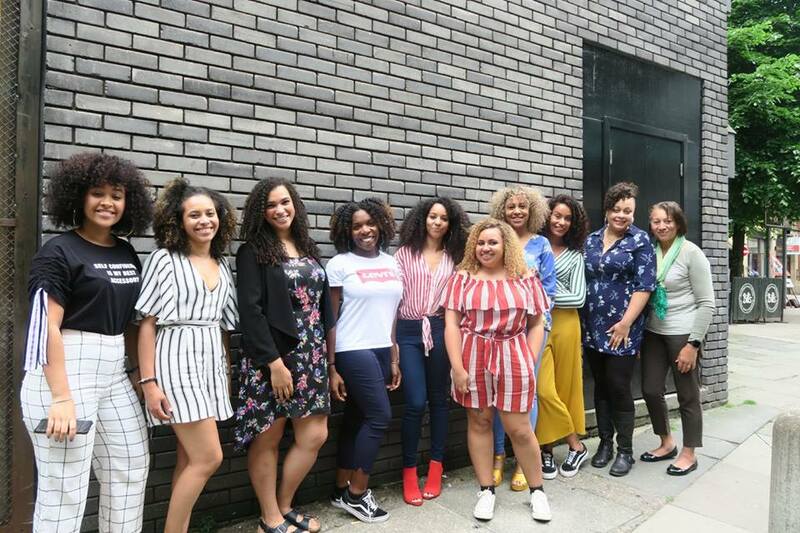 I have been following UKCurlyGirl aka Shannon, for a long time now as she posts everything from hair tutorials, product suggestions and hosts amazing events. She is also the creator of my fave brand Osocurly, whos' satin pillowcases and scrunchies i can not live without. I watched as she hosted a curly girl picnic in London last year, with envy. I wanted to be part of it so bad. 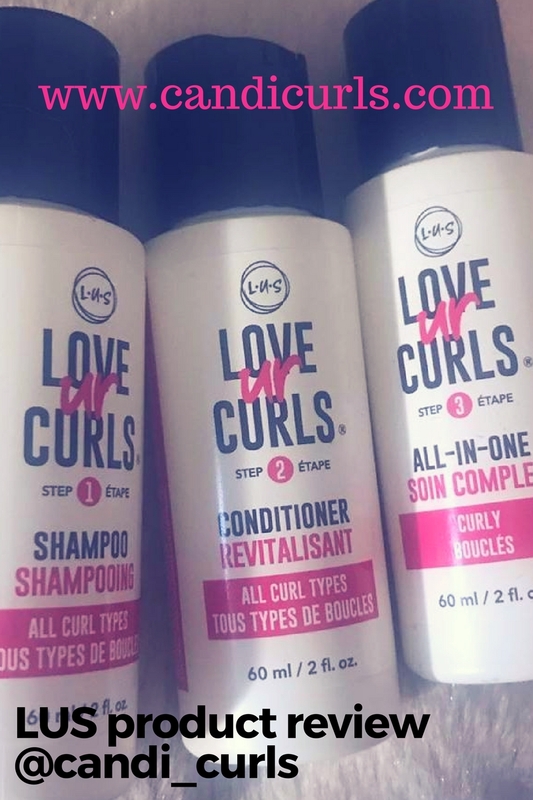 It looked like so much fun with curly girls coming together and included a hunt for products. 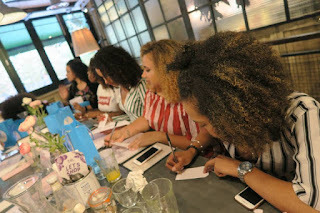 The next event i watched happen was the curly girl brunch. 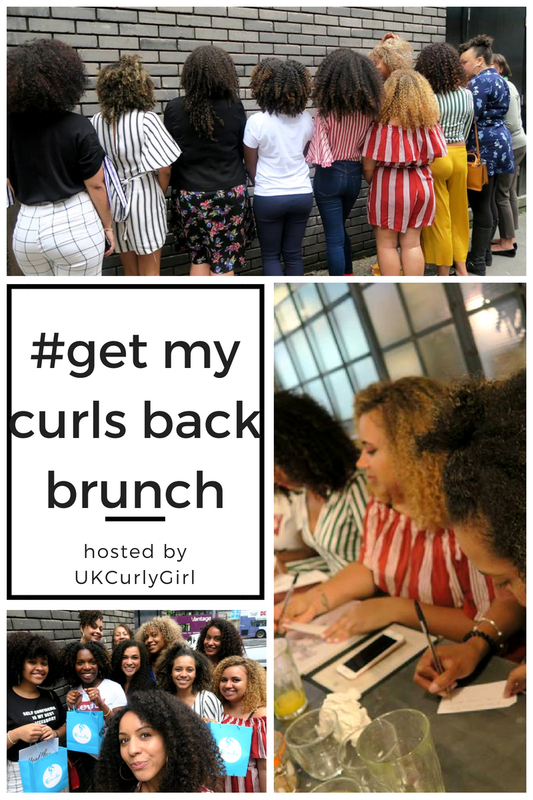 This event again brought so many curls together, to share their experience, learn some more tips and bond over their shared experiences. I was super excited when she contacted me to let me know that she was bringing this event to my city! Straight away i booked the day off work, i was not going to miss this. It's a strange family the curly world on instagram. We may not meet in person, but it is as though we are friends already. I couldn't wait to meet her and more curly girls in my city. Most of my friends have straight hair, with only a few sometimes rocking their natural hair. My sister has a different curl texture all together and isn't really into hair, so i often feel like i have no one to really talk about this kind of thing with. I can feel people becoming bored with me whenever i mention the struggles of having curly hair, because they just don't understand! I posted the event all over my page. 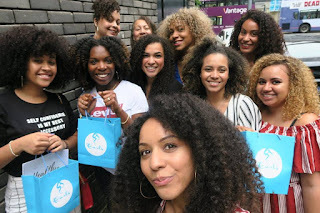 I wanted to be able to meet as many Manchester curly girls as possible! A few people contacted me to say that they were going and we shared our excitement. The first thing that struck me about the group, was how relaxed we all seemed. Not all of us knew each other, not all of us came with someone, but we were all excited to meet each other and the conversation did not stop flowing. There was never a silent moment. Funny enough, it seemed stripes was a theme. Myself, Shannon, Leah, Ileaka and another (who is not on instagram) all had on stripes! This was a great conversation starter if any of us did have any nerves. The table was set out with us all given a goody bag by curls, which included 2 full sized products and favourites of mine, the leave-in conditioner and the gel. It also had the cutest little mini denman key ring, an Afro comb also by Denman, and some sweeties. We were also all given a hair journal which includes tips, diary and more. Shannon started off by introducing herself to us and telling us about her hair journey. From bleach damage, to heat damage and having a "mini big chop" she has been through it all and wants to use her experiences to help others. She talked to us a little about her book Get my curls back where her full journey can be read about and how she transitioned from damaged hair to the goregous head of healthy hair she currently has. 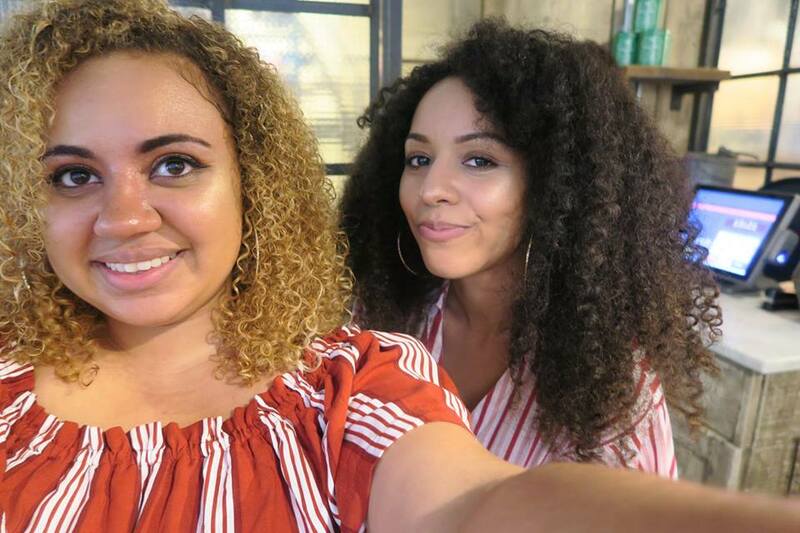 One of the questions we were asked, is about our experiences and ease at getting hold of curly hair dressers and products in Manchester. I recently did a blog post with Delux_Hair on this very topic, and it was interesting to see that i was not alone in how i felt. 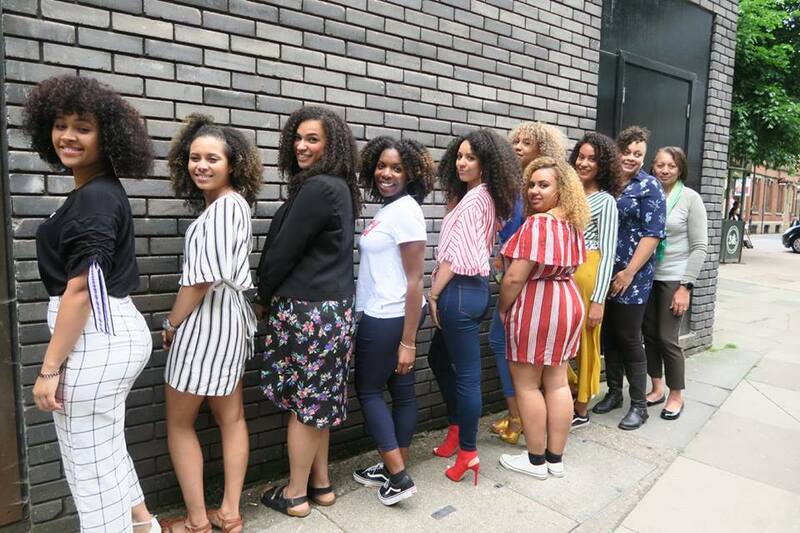 Girls shared their experiences of finally finding some of the popular brands in the "Afro" hair shops, but being charged way over what the online price is. Interestingly enough myself and 3 of the other girls, actually go to the same hairdresser for our curly cuts, because there is just one that we can find! Vicky at the McCrory Hair is fantastic with curly hair. It was crazy that we all used the same person, and i think that she will have a lot more customers since the rest of the group heard such good things. We had our brunch, and the conversation did not stop flowing. Everyone had something to talk about, an experience to share and advice to be passed on. After brunch we moved onto our booklets. One of the things we discussed was our top products. As a product junkie, i had used most of the products which were suggested, but what was fascinating for me, was the way it worked for everyone. Some products which were in one persons top 3, were ones which others just did not like and did not work in their hair. I always knew that all hair was different, but it was crazy seeing just how much this was. We spoke about our goals for this time next year, some of us wanted hair which was passed bra strap length without being stretched, some just wanted to revert damage and keep their hair healthy. I think that one of my favourite parts of the event was when we went around the room and told a little about our hair journey. Mine was simple. As soon as my mum stopped doing my hair for me, and i had to do it myself, it went up in a bun. I had no clue. If it wasn't scraped back like this then it was in clip in ponytails, or straight. I cut it all off twice and it was only in October 2016 that i decided to stop getting hair envy, and took the natural hair route to healthy hair. I was a little shy to mention one very important factor, due to my hair being scraped back so tight so often, i am actually left with bald patches. These patches have scared over and it is likely that the hair will not grow back. I have one on each side of my head, one more noticeable than the other, and one large one at the back. I can't wear my hair in two, have to use makeup to cover the side or have hair down over the top of it. It is something that i will talk about fine in posts which i have done before and you can read about it here, but i am still very nervous to talk about in it person. I thought that it was going to shock people too much as they assume that because my hair has a lot of volume, that it doesn't suffer from such things. I was wrong to think that i was the only one with a horror story of damage caused by themselves. One girl went against advice and bleached her hair multiple times close together, to the point her hair started to fall out. We have all cut it off at one point or another. Used chemicals so much that we burned our scalps, and lived the weave life. For me, this was the part of the session which i took in the most. It may seem sometimes that we are alone in our struggles, that no one really understands, or feel ashamed of the damage we have caused. We are never alone. Having other girls to talk about it who understand was amazing. The way we all laughed, related and bonded was incredible. I think we all now follow each other on instagram and i hope that we will all stay in touch. In the healthy hair journal put together by Shannon, is a section which i will always go back to. She has researched and listed ingredients to watch out for in our products. Not every product which claims to be natural, is actually good for our hair. Having this list handy is going to play a big part in the products i select in the future. Something else pointed out to me, which i had already recently started watching for, was the format in which ingredients are listed. They are done in quantity. If the first ingredient is not aqua (water) the product isn't going to be a moisturising one. If it says it contains coconut oil, but this is listed at the end or halfway in, then there isn't very much of it in the product. This information is amazing to have handy to me, and to be able to learn about for future reference and to pass onto others. At the end of the brunch, we were all asked to write something positive that we have learnt from the day. Mine was definitely about how different curly hair can be and how we may have different hair but we all understand the struggle. I will never feel alone when it comes to a hair struggle anymore. I honestly had such an amazing day and i really did not want it to end! I wish it went on for a lot longer, and i hope that i have made some friends not just on instagram but in life too. Keep an eye on Shannons instagram and Facebook page to find out when she is bringing this curly brunch to your city! 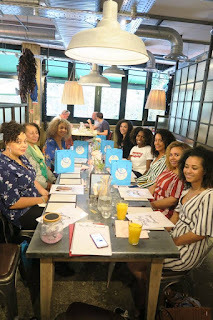 I honestly would recommend this brunch to anyone if you are experienced or just starting out in your journey, there are lessons to be learnt for all. Check out Shannons website www.ukcurlygirl.com and remember to follow her and all these beautiful curly girls by clicking on their names.